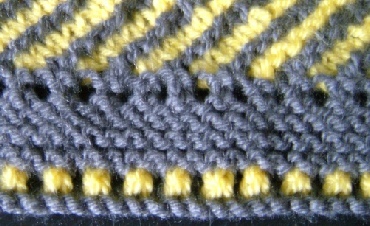 We have been experimenting with using the techniques of mitred knitting to add another dimension to illusion designs. This beautiful butterfly is the first completed design using the techniques simultaneously. The clever construction creates a mitred triangle with a line of symmetry for the patterning on the wing. This is only half the butterfly as the second half is added by picking up stitches and adding another identical triangle. You can see all of the butterfly when you spread it out but it becomes much more ephemeral when you are wearing it. As you move around different parts come in and out of view. This is not much more difficult to make than our other illusion designs. Because of the symmetry and ever-decreasing triangles, the charting is slightly different from our usual charts. We would recommend that you familiarise yourself with our methods before you try this one. The photo shows the fancy edging. The pattern also includes instructions for a simple, plain edging. This is what you see when you look directly at the shawl.